Here’s a few little treasures that have been around since the early 1950s, when the Lincoln Highway, Highway 40 and West Fourth Street – same street – rolled through our town. 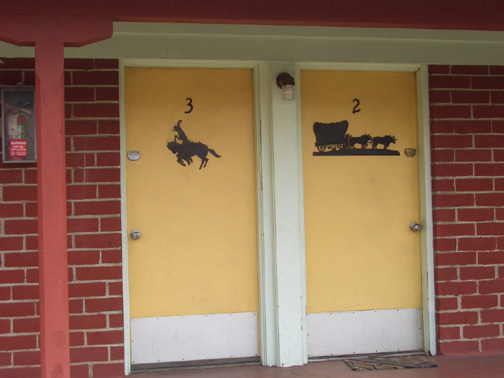 There’s a sign evocative of the ol’ west, all different, on every unit door in the motel like the two seen here. These iron signs have been on the doors of the motel since then, crafted back in the days well-before they could be done by a water-jet steered by a computer, or plasma welding as it would be done today. They’re neat. 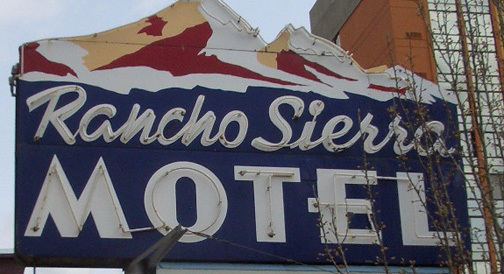 I’m always surprised as I drive by the motel at 411 West Fourth, north side of the street, that they’ve survived the ravages of time and aren’t in somebody’s back yard now. Maybe I shouldn’t even post this – I might endanger them. But our readers are pretty upstanding folks, and will just drive by and enjoy seeing them.